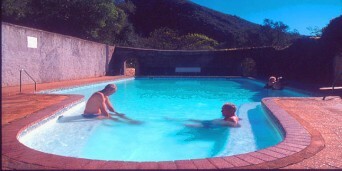 Petersfield Mountain Cottages is situated less than 2 hour’s drive from Cape Town. It overlooks the majestic Cederberg Mountain range and the flourishing orchards of this fruitful valley. It is an export citrus and rooibos tea mountain estate, and it has so much to offer the tourist seeking a quick breakaway from the hustle and bustle. 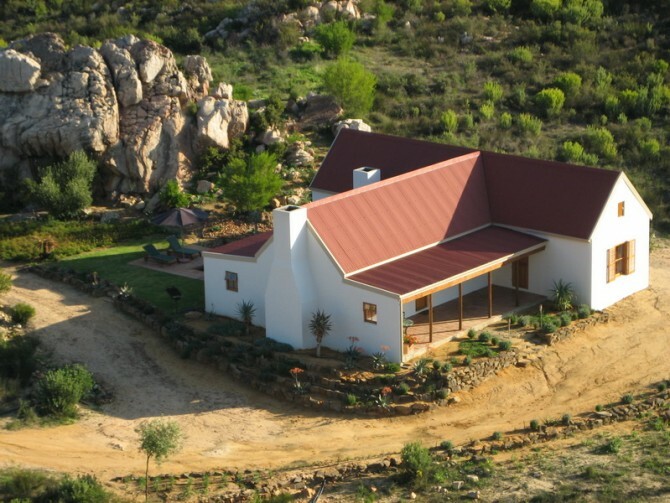 Petersfield Mountain Cottages is about five kilometers from Citrusdal, therefore is very convenient to guests if they wish to pop into town for lunch or dinner, have a cup of coffee in one of the coffee shops, or just take a drive to explore the area. 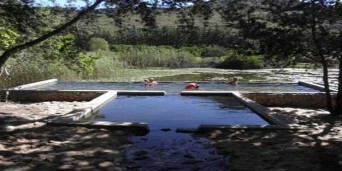 Petersfield is located within an extremely private 2000 hectare wilderness reserve. It boasts pristine Fynbos and is packed with indigenous wildlife. A wooden cottage set under oak trees next to a mountain stream. 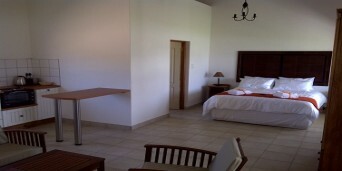 This lovely cottage has two bedrooms with a sleeper couch which can accommodate up to 6 guests. It has a sparkling blue plunge pool for those hot summer days. This tucked away cottage has a commanding view of a citrus orchard with sandstone cliffs in front. It has two bedrooms and a sleeper couch to accommodate 6 guests. The double French doors lead onto the veranda for outdoor dining next to the private plunge pool and braai area. This is the biggest cottage with three large rooms, lounge and kitchen. It has a plunge pool and outdoor shower to cool you off. It has a romantic outside bathroom privately set in the bush. Enjoy bathing in an old Victorian bath under the stars, champagne in hand! This is the newest cottage. It is very high up in the mountains, and designed to accommodate a couple. This is perfect for a romantic getaway, with a spectacular view of the mountains and the valley below. Inside the cottage it’s intimate and cozy with an open plan lay out. The splash pool on the same level as the front veranda will cool you down in the summer heat. So make Petersfield your next breakaway destination and expect a splendid relaxing breakaway! Surrounded by spectacular scenery and scented citrus orchards, accommodation in Citrusdal, Western Cape, is a perfect option for anyone seeking a relaxed holiday getaway. Discover South Africa is your portal to this wonderful small town and our selection of Citrusdal accommodation has been meticulously picked to ensure you only experience a wonderful vacation. You can search for the one you think is best suited to your preferences and further explore some of the activities you may get up to when you arrive in the town. Approximately 177km from Cape Town, Citrusdal is a small town with a population of about 5 000 or so inhabitants. 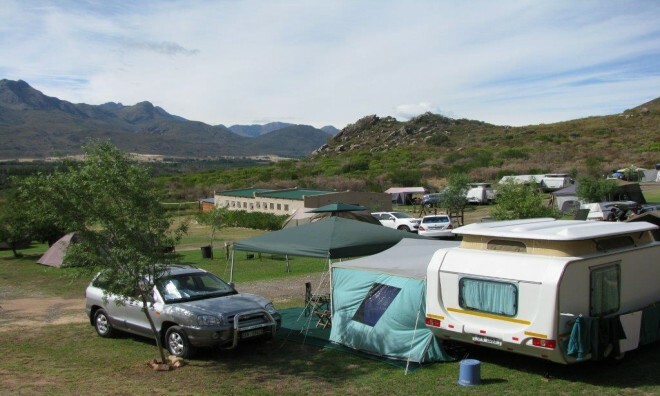 The mountains of Swartberg and Bokkeveld overlook the town, with excellent mountain hiking trails on offer. The accommodation Citrusdal offers ranges from farm guesthouses and bed & breakfasts, to self-catering cottages. Whether you are looking for some solitude or a quiet couples or family retreat, you will be happy with the town's accommodation offerings. What's more, Citrusdal is easily accessible using the N7 from Cape Town. Being so close to the Cederberg Mountains, your accommodation in Citrusdal will afford you the opportunity to explore some of the majestic wonders that make up this beautiful country that Discover South Africa calls home. For the sports enthusiasts, you can look forward to rock climbing, ATV trails, zip slide tours and much more. Ancient san rock paintings decorate many of the mountains that surround the town and taking part in a hiking tour around the mountains will have you stumbling on one or two sites. The Citrusdal Museum is also a place of interest for anyone looking to understand the historical significance of the town. Whatever you choose to do while staying in any Citrusdal accommodation on offer, your vacation will be filled with memorable activities which will have you coming back before you know it. With Discover South Africa, finding the right accommodation in Citrusdal or anywhere else in the country is fast and simple.